Last year, Helen Couchman armed herself with three mirrors and a camera and headed straight into the streets. The mirrors were placed in various positions to “fuse the different elements” of the scenes she took, as symbols to help express her feelings that subsequently resulted in a photo exhibition in the Chinese capital. One of Couchman’s aims was to showcase the “multiple textures and vistas” of the traditional Beijing alleyways, or hutong, that faced new threats of being demolished to make way for new buildings. “It has a performative angle: process, construction, dirt, proximity and distance are all evident in these images. This is what I am working with”, she says. The In Beijing exhibition was one of the latest efforts by Couchman, who has lived in the capital for six years. 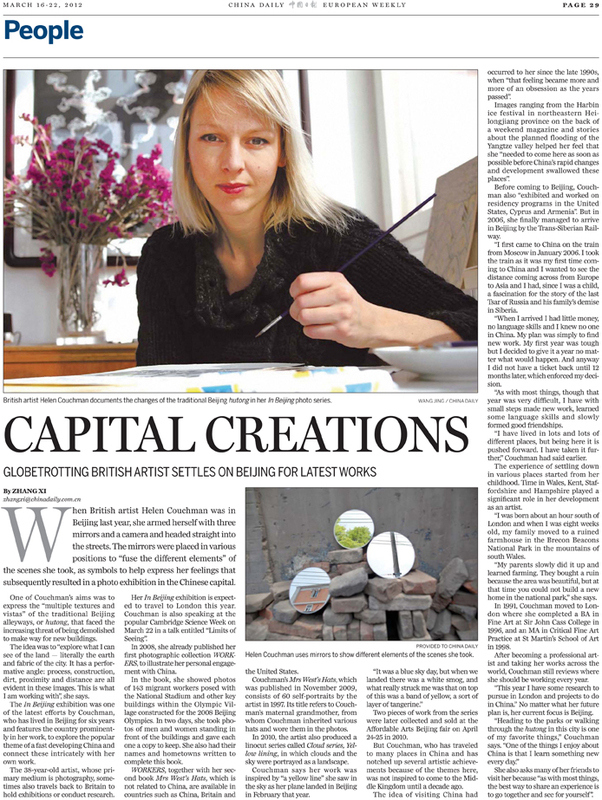 Her work often explores a popular theme: a fast developing China. The 38-year-old artist, whose primary medium is photography, sometimes also travels back to Britain to hold exhibitions or conduct research. She expects her In Beijing show to travel to London this year. Last week, Couchman was speaking at the popular Cambridge Science Week in a talk entitled Limits of Seeing. In 2008, she published her first photographic collection Workers, to illustrate her personal engagement with China. In the book, she showed photos of 143 migrant workers posed with the National Stadium and other key buildings within the Olympic Village constructed for the 2008 Beijing Olympics. In 2010, the artist also produced a linocut collection called Cloud series, Yellow lining, in which clouds and the sky were portrayed as a landscape. She says her work was inspired by “a yellow line” she saw in the sky as her plane landed in Beijing in February that year. Couchman, who has travelled to many places in China and produced considerable work here, was inspired to come to China a decade ago. Images from the Harbin ice festival in northeastern Heilongjiang province on the back of a weekend magazine fascinated her. Even more compelling: stories about the planned flooding of the Yangtze valley. She felt she “needed to come here as soon as possible before China’s rapid changes and development swallowed these places”. In 2006, she finally got to Beijing via the Trans-Siberian Railway. “I first came to China on the train from Moscow in January 2006. I took the train as it was my first time coming to China and I wanted to see the distance coming across from Europe to Asia and I had, since I was a child, a fascination for the story of the last Tsar of Russia and his family’s demise in Siberia. “I was born about an hour south of London and when I was 8 weeks old, my family moved to a ruined farmhouse in the Brecon Beacons National Park in the mountains of south Wales. “My parents slowly did it up and learned farming. They bought a ruin because the area was beautiful, but at that time you could not build a new home in the national park,” she says. Now a professional artist and taking her works across the world, Couchman still reviews where she should be working every year. “This year I have some research to pursue in London and projects to do in China.” But her current focus is Beijing.